Who Says You're Too Old To Dress Up? What do you mean you can't think of any good ideas for an adult Halloween Party? Adult Halloween Party Ideas just for us big kids! Halloween parties are just as fun for us grownups and with a good party theme can be even more fun than the cake walks and costume contests we enjoyed so much as children. There are literally thousands of fun, scary, and unique adult Halloween costume ideas out there and we find that a good theme party makes choosing costumes even easier while letting each guest put their own unique spin on their costume. While it gives each guest a place to start when planning their costumes, it also allows for a great deal of creativity. Carry your theme idea through every part of your Halloween Party and it will add that extra special "spark" to your party. an be part of the party theme too. You can use the costumes as a part of the entertainment! You can get little prizes and have a “Best Costume Contest". How Will My Guests Know What the Party Theme is? You can let them know on the invitations! Find some adult Halloween party invitations that let your guests know the theme of the party is...! Whether you choose Monster Mash or Famous Couples as your party theme you can write costume ideas right on the adult Halloween party invitations your sending or via e-mail. Not all your guests will show up in a costume related to your theme, but that's okay. It will still be a lot of fun to see everyone in whatever Halloween costume they choose. 1. How about Unique Adult Halloween Costumes. 2. Or Couples Halloween Costumes. 3. How About Costumes from a certain period in history,like the 1950s or the 1970s. 4. Whether it's a scary monster costume or a funny one, we all have our own favorite monster. 5. In a Murder Mystery Party each guest will be asked to wear a specific type of costume so they can act out their role in the drama. 6. A Haunted Castle party theme leaves costumes to the imagination of each guest. 7. There is no end to Famous Couple ideas! You may see Anthony and Cleopatra chatting it up with Lucy and Ricky, or Casper and Wendy hanging out with Dorothy and the Tin Man! 8. How about Pirates of the Caribbean Costumes? Every young boy dreams of being a dashing, heroic pirate. And every young girl dreams of being swept off her feet by one. Well, you may not be that young anymore, but it still sounds like a lot of fun! Your guests can recreate their favorite childhood costumes from famous pop culture cartoon characters to the traditional pirate/vampire/ghost costumes. Let the food and music be party of your party theme too. Food and drinks at your halloween party can easily be incorporated into any theme you choose. Do you want some Halloween recipes? You can find all kinds of scary, spooky and creepy Halloween sound effects to play at your party. You can find Monster Mash dance party music too. Sound effects, or spooky music, will help your party guests get into the party mood! You don't have to buy a CD if you don't want to. You can find plenty of free Halloween music online for you to download. Adult Halloween Games can be a scream...couldn't resist the pun! Adult games are usually very entertaining and even the old classic games are lots of fun. Halloween Charades is good for adults to play and so is Halloween Karaoke! Get a karaoke machine, print out some lyrics to monster and Halloween songs, and have a FrightFest Karaoke Contest. Can't you see old Dracula up there crooning? Your going to need lots of pictures and a video of this! 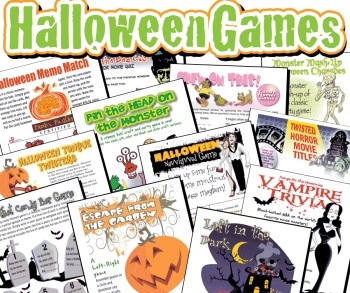 Halloween printable games are always lots of fun for everyone. Want some "Gory" Halloween food game ideas and recipes? Having a Haunted Castle theme? How about serving "Witches Brew" from a cauldron. A "Zombie" would be a great drink choice at a Monster Mash. You can create “Trick-or-Treat” stations and the party food can be decorated and disguised to match your theme easily. You can get some ideas on the Halloween Recipes page. You will find activity and game ideas on the Adult Halloween Party Ideas for Games page. So why let the kids have all the fun? This Halloween, get into the October holiday spirit with a spooktacular adult party of your own! Your grown up friends will love the idea of an adult Halloween Party where they can let their inner children out to play dress up games! I'll bet everyone comes up with more adult halloween party ideas for next year! I'd love to have you join our "Let's Party" newsletter. Every couple of weeks or so, you'll get some wonderful new ideas!